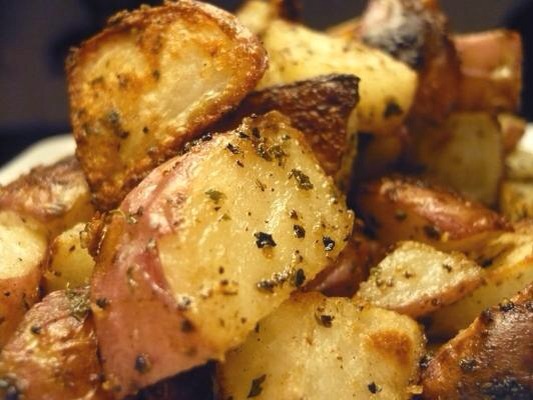 Yummy Potatoes That Are Easy To Make! Preheat oven to 400. In a bowl, stir together the potatoes, olive oil and all the spices. Spray a 9x13 pan down with cooking spray and add the potatoes concoction. Cook for about 55-60 minutes, stirring every 20 minutes. After the potatoes are cooked, add the shredded cheese and cook for 5 minutes. Add 1/2 lb chicken to the spices and oil and bake and that is yummy as well!